Anybody who attends an event already has an interest in what is on offer. The fact they are attending this event means they are already open to the idea of your business. The important part for you is making sure that it’s your products or services that will gain greater attention over the competition. When attending an event, you want your exhibition stand to be the one which really stands out in the visitor’s minds. One of the best ways to make your brand memorable is by adding an interactive experience to your event. If you can get the event attendees involved, they will have a more powerful experience. As a result, they will be more likely to show a keen interest in your business, products and services. Here are 5 ways you can make your next event stand out. Adding a TV screen or monitor to your exhibition stand will allow you to showcase much more of your business without taking up valuable floor space. A high-quality video is eye-catching, stimulating and informative and will draw in passing visitors. Whether you have a large 9m² exhibition stand or you have a 3m² shell scheme space, adding a TV screen will increase the chance of success. Most exhibition stands today have a TV screen or laptop on display. It provides the opportunity to send out a strong message of what your business has to offer, without crowding your exhibition stand. Your video or show reel must be interesting, catchy, informative and most of all it must spark conversation. You don’t want to give all the information away so visitors ask questions and engage in conversation with you, resulting in a lead to follow up. 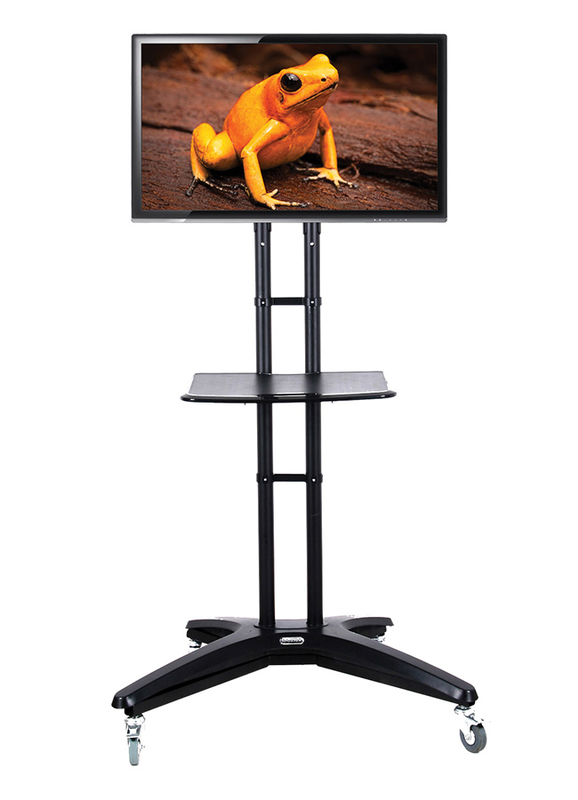 Our portable TV and monitor stands are perfect for adding an audio visual aspect to engage your visitors. The Mobile TV and Monitor Stand on Wheels is a portable solution for mounting both TVs and monitors up to 60” in size or approximately 45kg in weight. For just £138 it’s a cost effective solution which can also be used in the office once the exhibition is over. For £230 the Portable TV Stand is stylish, freestanding and can be used to mount both TVs and monitors. The heavy duty, easy glide castors make it highly portable and easy to manoeuvre around your event. The TV stand is ideal for displaying marketing media in high traffic locations at events. The XL 60 Free Standing TV Stand is a static TV stand which can be used freestanding. A unique feature of this TV Stand is that it can be integrated into our pop up displays, creating a stylish exhibition display that engages with your attendees through the use of promotional audio visual content and printed graphics. Social media can play a big part in engaging your exhibition audience. It’s not only used in the pre-event marketing but it should also be used as a part of your exhibition experience. Your social media accounts should be active in the lead up to your event. It’s a free marketing tool and allows you to reach out and let customers know about the details of your event. During the show its great if you can keep that social connection going. It might be a good idea to have one person on the stand dedicated to managing the social media accounts so that you can stay on top of it. By doing this you can personally thank people for visiting your stand which makes your relationship more personal. You can use the event hashtag (#) in your status updates which will help you to reach a wider audience. Create your own hashtag and encourage people to use it and share it when interacting on social media. You could run an online competition via your social media account which will help you to increase your followers, engage in conversation and keep that online presence going. The internet in a powerful tool and social media usage is ever growing, by adding this tool to your exhibition experience then it’s likely to have a positive effect on your success rate. Touch screen technology and gadgets not only help attract visitors to your stand, but can also increase the time spent on your exhibition stand. Adding an iPad or tablet to your exhibition stand enables you to showcase different aspects of your business. You have quick and easy access to a library of digital media such as photos and videos at the click of a button. They are also great for gathering contact details, completing surveys and demonstrating your products and services. They don’t take up too much valuable exhibition stand floor space and can offer so much more than a product sample on a table does. You can lock down your touch screen display to your website so that visitors can browse the rest of your business and not be restricted to just what is on display that day. It may be that another part of your business is what generates the lead, and by having access to it via touch screen technology will not limit your success. Each stand has a lockable iPad enclosure, supplied with security keys with rotation, swivel and tilt functions allowing iPads to be used in either portrait or landscape orientation. 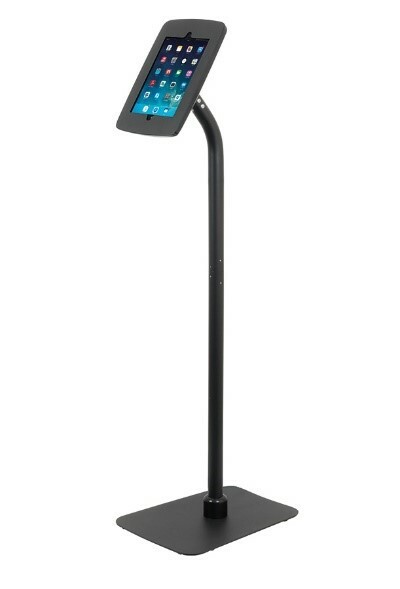 With prices starting from as little £49 we offer an iPad stand which is suitable for all budgets. Offering refreshments is a great way of attracting visitors as well as increasing the time that they spend on your exhibition stand. If space permits, offering a comfortable seating area where you can entertain visitors whilst offering refreshments will have a greater impact. After hours of walking around the exhibition hall visitors are sure to be lacking in energy and starting to get hungry. Offering them some light refreshments, or somewhere to sit will encourage them to visitor you, giving you a perfect opportunity to sell your business. You don’t have to offer anything fancy, something simple like a bowl of assorted chocolates is a cost effective option. Hot drinks or bottled water also benefit you as it gives you time to engage the visitor in conversation while they are enjoying their drink. Research indicates that 70% of customers are more likely to visit you if you offer snacks & beverages - so it’s something worth thinking about. A great way of attracting visitors to your exhibition stand is to run a competition. It’s a well-known fact that people love to win and if they go away with a quality prize then it’s even better. It’s not just about the winning, people also love an element of competition. As long as it’s all in good sport then some healthy competition amongst your customers will only increase the rate of success. The more people who take part and talk about it, the more people it will draw in. The important thing with competitions at events is to make them work for you. It’s pointless running a competition with little to no engagement, where people don’t even need to acknowledge your stand or what you have to offer. Your competition needs to be engaging enough for you to have plenty of time to start a conversation with them. For ideas on the type of competitions which are good to run on your exhibition stand have a look at Great Competitions to Engage Your Exhibition Stand Visitors. We hope these tips help you to engage your trade show attendees and have a successful exhibition. At XL Displays offer a wide range of portable display products, including pop up stands, roller banners and branded tablecloths.